Businesses spend a lot of money on human capital. Spend it more efficiently by automating the rote tasks with our data formatting features. Your marketing data belongs to you. It’s too valuable an asset to be locked away and doled out in useless, pre-aggregated chunks. 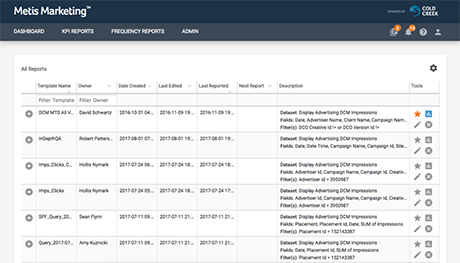 The right vendor helps you collect complete, granular data from yesterdays campaigns and use it to build better marketing campaigns for tomorrow. Data formatting shouldn’t take you weeks, or even days. It shouldn’t require your analysts to set aside beneficial work to manually sort through and stitch together data files. Here’s how we help you cut it down to hours. Imagine you just wrapped up a multi-touch conversion attribution analysis of last year’s digital marketing performance. The campaigns are over, and now it’s time to see how effective they were. Except there are thousands of files to integrate and organize before you can start. Those days and weeks of analyst time are expensive. All that arduous, tedious, unglamorous prep work is better suited to computers and automation. Our Data Formatting tool, like other products in the Metis Marketing Analytics Platform, was born out of the need for superior, custom marketing data sets. It’s based on the same core processing stack that drives our RFO (Reach, Frequency, and Overlap) reports. You can also take the data files created from our Data Formatting tool and feed it into other systems and processes. Use it for attributions, order matching to back-end data, or file deliveries for frequency cap compliance. 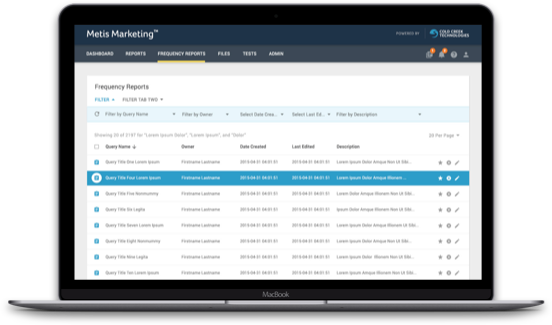 Our Data Formatting tool empowers you to get faster, more actionable results from the most granular marketing data available. Guided Process: The guided process in Metis is simple and fast. Our interface leads you through every step, prompting you to choose the data you want, how it’s formatted, who gets it, and when it gets delivered. 1000X Faster: Metis uses a proprietary technology stack more than 1000x faster than equivalently scaled databases or Hadoop solutions. Big data doesn’t have to mean big wait times to find out how your campaigns perform. Lower Costs: Save time and money by making computers do the preliminary grunt work before the real analysis happens. Our data stitching technology helps you get more efficiency out of your labor force. More Revenue: An analyst’s job is to know how your marketing performed yesterday so that you can make better decisions for tomorrow. Use our Data Formatting tool and leave your analysts free to focus on the decisions that bring more revenue to your business. The guided process in Metis is simple and fast. Our interface leads you through every step, prompting you to choose the data you want, how it’s formatted, who gets it, and when it gets delivered. Metis uses a proprietary technology stack more than 1000x faster than equivalently scaled databases or Hadoop solutions. Big data doesn’t have to mean big wait times to find out how your campaigns perform. Save time and money by making computers do the preliminary labor before the real analysis happens. Our data stitching technology helps you get more efficiency out of your labor force. An analyst’s job is to know how your marketing performed yesterday so that you can make better decisions for tomorrow. Use our Data Formatting tool and leave your analysts free to focus on the decisions that bring more revenue to your business.